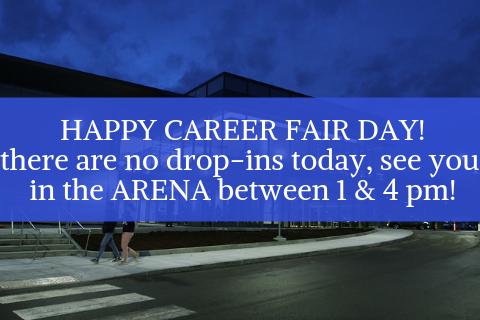 There will be no sophomore or career coach drop-ins today, but we will see you all between 1 pm and 4 pm in the Arena for the Career Fair! For last minute tips, click here. For last minute Dress for Success advice, click here. For snowy weather prep, click here. Don’t forget your lanyard, your student ID (just in case), your padfolio, and your resume! If you need water or a mint, stop by the Career Services table! Make sure to #DressforSuccess, practice that elevator pitch and we will see you soon.